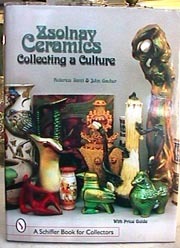 "Zsolnay Ceramics Collecting a Culture" with price guide: "This beautifully illustrated guide to Zsolnay ceramics, featuring over 400 color photographs, covers the three main periods of Zsolnay production, including 1868 to 1897-Folklorism, Historicism & Victorian Eclecticism; 1897 to 1920-Art Nouveau (Secession in Central European terms) and Art Deco (Second Secession); 1920 to the present-Modernism. An entire chapter; fully illustrated is also dedicated to Zsolnay marks to help collectors identity their pieces." This book is 191 pages and is a large format hard cover. The over 400 color photos detail Zsolnay by size, form number, date of production and current market value. Price: $49.95 + shipping.